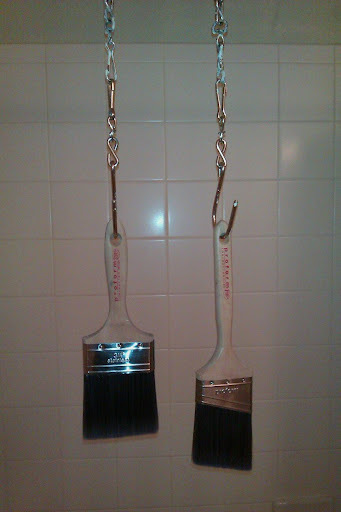 An example of the best way to hang your brushes to let them dry. 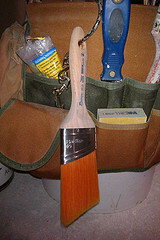 When you hang a brush to dry all paint residue is pulled to the tips of the brush rather than drying inside of the ferrel. This will help to prolong the life of your brush. There are multiple hanging options: hook two pail hooks together and hang them from a shower curtain rod or something similar, or you can take a single hook and clip it onto the ladder, or you can put the hook all the wall through the hole in the handle and hang it from your tool bucket. You can really hang out any where. Just be careful, if you hang out too long you'll be arrested for loitering.